What is expected to be the largest demonstration against fracking to date will take place on the West Lawn of the United States Capitol, Washington, D.C. from 10 a.m. to 2 p.m. on July 28th. 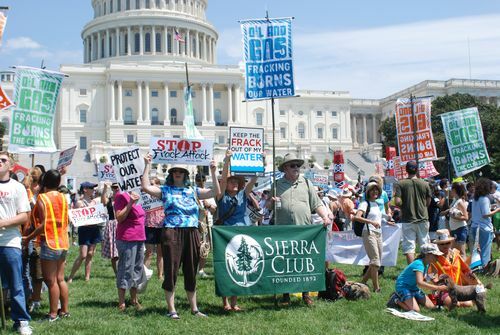 On Saturday, July 28th, more than 5,000 people rallied on the West Lawn of the Capitol in Washington, DC, and then marched through the streets of DC as part of the Stop the Frack Attack Rally. This was the first-ever national rally on fracking. “Fracking,” a violent process that dislodges gas deposits from shale rock formations, is known to contaminate drinking water, pollute the air, and cause earthquakes. “Our call to action, in concert with over 130 other organizations, was to demand that no more drilling harm our public health, water and air,” said Deb Nardone, Director of the Sierra Club Beyond Natural Gas Campaign. “Elected officials and public agencies must put communities and the environment first, starting with removing special exemptions and subsidies for the oil and gas industry, while ushering in clean, renewable energy.